What a bleak morning. 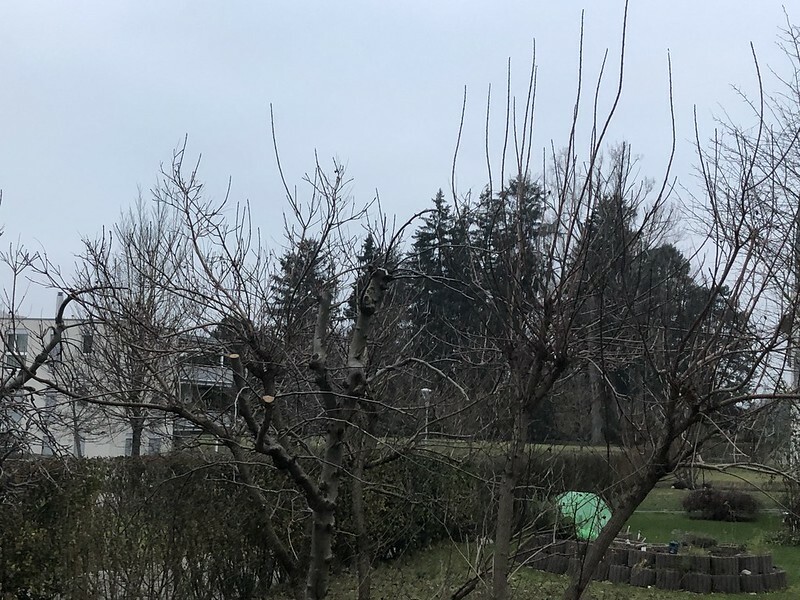 No clouds, bare branches on the trees and just a background noise of crows – could be something from a horror film. However I am up and ready to go, although it takes time to get into movement. Do you have that as well, when you take the first steps in the morning and your back stays in bed. You wonder if you will make it to the kitchen? I do, but here I am hammering away again on the keyboard. 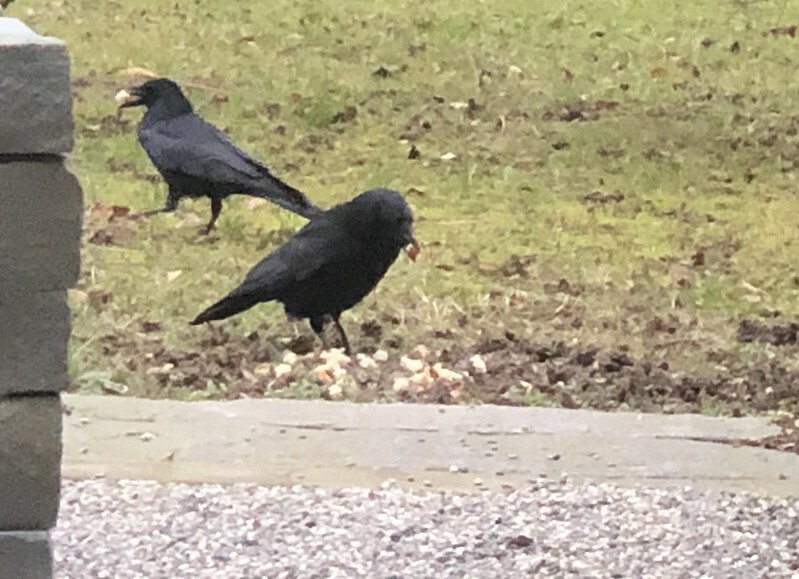 The first crows have already arrived for breakfast. I took the photo from my place in the kitchen with my mobile phone, close up manipulated, so quality is not exactly Pulitzer prize worthy. Actually the sparrows were there first, but as soon as the big birds arrive they fly off, probably something to do with species dominance. After the crows chose the best bites they flew off and yes, the sparrows are back again. The main thing is I have no old bread remainders left. Speaking of bread, I have even baked the week-end bread. OK, I am cheating. 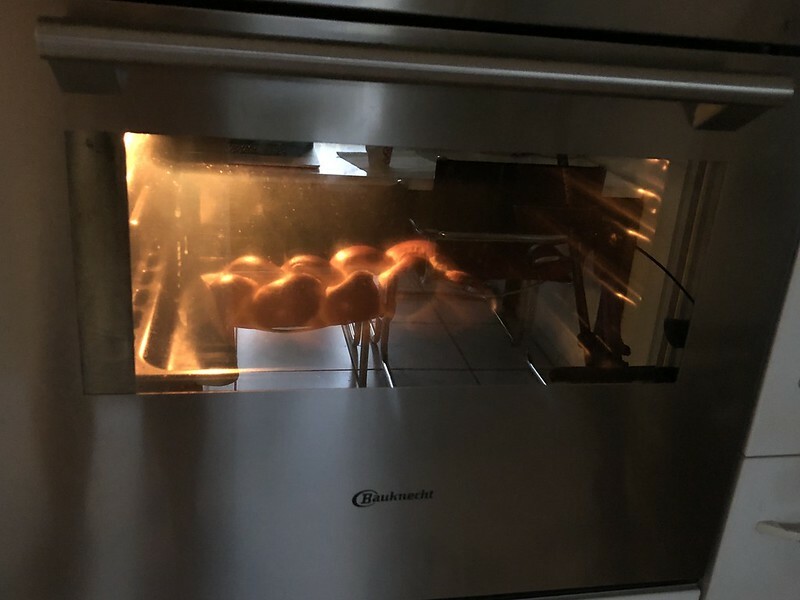 You can buy the bread in the store sort of half baked and do the finishing touches at home for 10 minutes in the oven. I usually do this in the afternoon, but I discovered I only had a hard remainder from yesterday which I chopped and scattered for the birds in the garden. I like something a little fresher for my breakfast. I am a little short on new photos this week, due to doctor appointments and driving the car myself alone, no longer being the passenger. I used to take a few photos from the car on the way to the store, but that is finished. 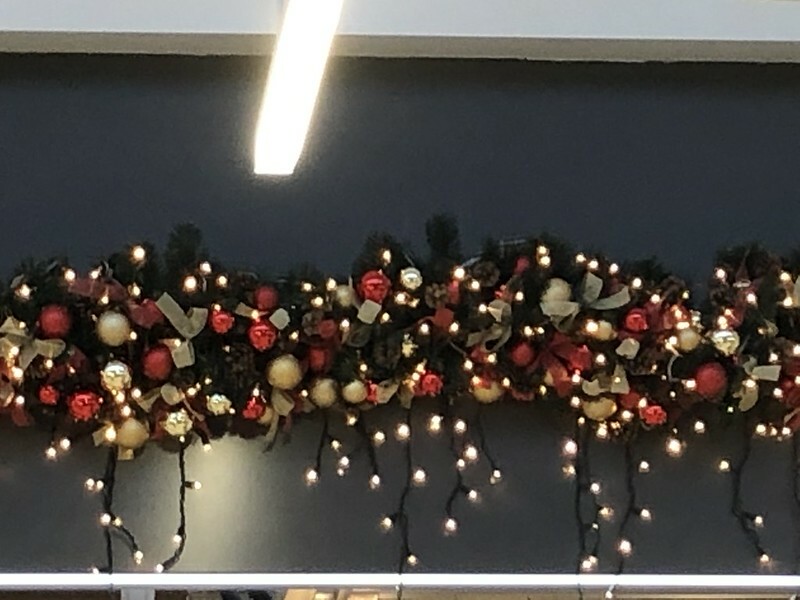 I did managed to get a photo of the Christmas decorations in the mall for something a little different but even there my opportunities are now more limited as I have at last found a better place for handicapped parking, with more places available, but at the side of the store, meaning I no longer arrive at the entrance where the big Christmas light show is. Although I still take the lift down when the shopping is completed if I have a few other things to get, like in the drug store. Yesterday I had to make a detour as my doc told me I should get some vitamin D. It would help to strengthen my bones in the case that I might/probably would fall. They do not need a prescription and I was surprised that the price was reasonable. She usually gave me the medicine herself, but I only visit now when I must. I got the results by telephone of my blood test for the long term diabetes test and it seems I am in perfect health. Even the sugar was manageable with 6,5 whatever. This was a surprise as now and again I might forget a tablet, especially in the evening when my sugar is at the highest point, and I do like some chocolate now and again. It’s the daring things you do in life that breaks the boredom. 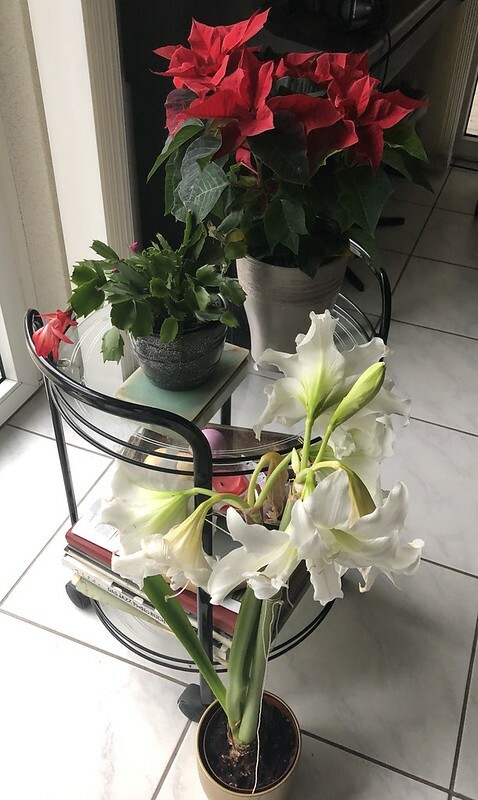 The rescue mission for my amaryllis is now completed and I hope it is a success, the problem being that it was top heavy and looked like the leaning tower of Pisa/amaryllis. It is now tied to my flower table with string and it standing upright again. I really did not want to risk losing my flowers as last year when it took a dive to the ground. These white ones are a bit special, not the normal white ones and I managed to get the last one they had in the store. And that is all there is to report from the wilds of Switzerland. This morning I will stay at home tending to the apartment and myself. I will probably take a trip to the temple of shopping this afternoon. Saturday afternoons are fun as I do not have to get a lot of shopping, this time bird food is on the list. I can take my walker, do not need the trolly and there is some people action, but not too much. Yesterday there were some little frozen spots of snow in the air, but today it is just plain cold. Enjoy the week-end, make the most of it, and keep safe. Just a day in the life of an Angloswiss. Good morning to you too. Vit D is good for bones and general well being. Good advice from the doc! Vit D is the ‘big thing’ here right now. I have to take tablets because the sun (Vit D) is what caused my melanoma cancer in the first place. Take a pill. Avoid the sun. I am glad you received a good doctor report. That is what you always want to hear. At the moment I am feeling OK. It is just a matter of adapting. I am one of the lucky ones with the sun. I have a skin that tans naturally. I used to be a sun bather, but over the past few years no longer. I hope you have your problem under control. It is also one of the reasons why I no longer go so much in the sun now, our atmosphere is not what it used to be. Glad to know you had a clean bill of health, and are driving yourself back and forth. Sorry that Mr AS’s back problems are clipping his wings; I know what you mean when you get up and your back stays in the bed. That’s the only time I walk painfully, but thankfully it usually wears off by the time I’m in the bathroom. 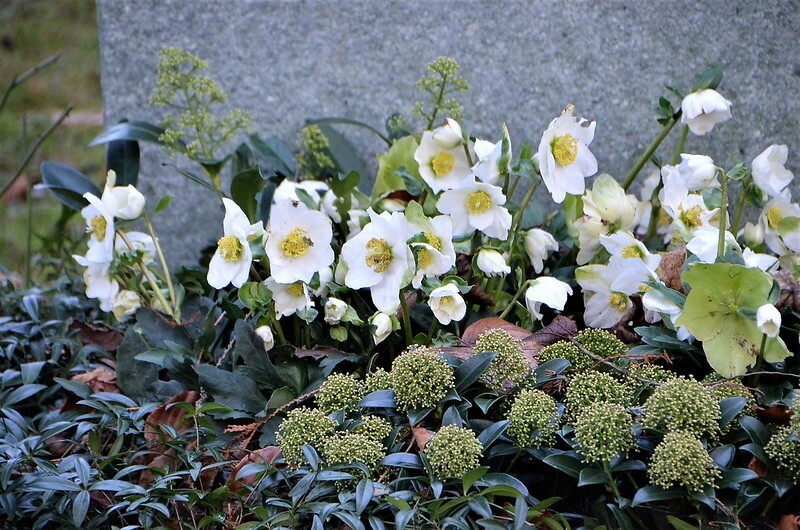 And those are lovely Christmas roses in your last photo; I know the real name is helleborus, but I like the first better. I was in Santa Fe this morning and they have pockets of snow and ice everywhere, though there’s none yet in Albuquerque. Yes, we do have a real winter despite being desert country. Stay warm and well. Happy Holidays. I am now glad to have the car as I now have to do everything: shopping and housework. It is becoming a stress slowly and I have no time for myself. I a, having to reorganize my life. The back problems do wear off eventually. I had some Christmas roses in my garden. The advantage is that they regrow every year. Luckily we have no snow yet, as I really don’t like driving in it. Those white hellebores in the last picture are impressive. We grew hellebores for years, but I never liked them. They were never pretty, but landscapers bought as may as we could grow, just because they are so uncommon. I do not think that their uncommon nature is necessarily a good reason to plant them. Things are sometimes rare for a reason. I think these were rare in our climate because they never look good here. I am also taking Vitamin D, although I’m not sure how much of a difference it makes. At least it’s chewy and tastes good. Oh, the beauty of those flowers! I have a heavyweight white Amaryllis on the brink of completely opening up. The heavy five flowers to open up dance on a breathtakingly long stem and even turning the whole pot regularly to get the plant NOT to lean too much towards the light, didn’t help at all – it will be a nightmare to keep upright and most times the stem leans over one morning and thus reducing the joy of those magnificent flowers drastically. But they are just the greatest plants in winter, aren’t they?! The other one I SAVED over summer has been eaten up twice by tiny snails and I’ve given up on it. It stands outside in the cold, totally butchered up by the little bastards and it will go on the compost in due course. I am now successful with keeping my amaryllis and having flower again. I managed to save this years from toppllng.